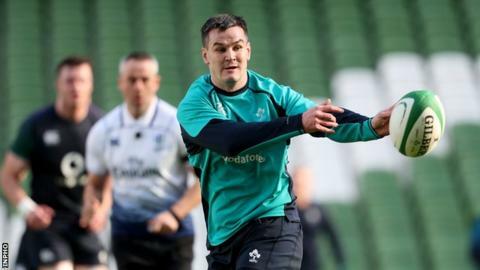 Ireland fly-half Johnny Sexton is expected to be fully fit in time to face Italy on 24 February. The fly-half was taken off in the first half of Ireland's win over Scotland and did not return to action after failing an HIA (head injury assessment). "Johnny is fine, he trained fully [on Friday] and will be ready to go," said defence coach Andy Farrell. "He has had no symptoms at all, no complaints throughout the week." Sexton, 33, suffered an ankle injury and a concussion inside the opening 20 minutes in Edinburgh and was replaced by Joey Carbery. Leinster man Sexton, who has started Ireland's last 10 Six Nations games, was named 2018 World Rugby Player of the Year after winning the Grand Slam and helping his province to a European and Pro14 double. Farrell will take over from Joe Schmidt as head coach after the World Cup later this year. The two-time British and Irish Lions coach has become a popular figure within Irish rugby since joining Schmidt in the Irish set-up three years ago. "It's something I've been working towards, something I'm up for and excited about at the same time," he said. "I'm proud and privileged to be asked to take over after such a brilliant coach like Joe. "Fortunately enough as well I get a bit of time to keep on learning in the meantime." Along with Schmidt he has helped mastermind some of Irish rugby's most famous victories in recent years, including two wins over world champions New Zealand. "I have become a better coach under Joe, 100%," Farrell said. "What you get when you're in our environment is you get to share ideas and we tend to give quite a lot of feedback to each other. "You're learning constantly and it shapes the way you think and learn on the run."